A bridal suit, also know as a wedding suit or even a two piece special occasion dress, could be your best choice for wedding attire if you are a mature bride. Want something for the honeymoon. Want something practical so that you can wear it again. The wedding suit is a 2 or 3 piece wedding outfit. It usually consists of a jacket, sometimes a top and skirt in any length. The Wedding Theme: A formal length skirt would be floor length or tea length. For an informal look . . . choose a "street length" skirt. The best fabrics for the wedding outfit would be soft light to medium weight fabrics. Fabrics: These could be satin, crepe back satin, silks, cotton, linen, polyester silks, some light weight brocades, crepe and peach skin fabric. Any dressy soft fabric will work. A Warning About Lace Fabrics: Wedding suits are also designed using lace fabric. If you are a mature bride, pay particular attention to the lace texture and pattern when considering wearing an “ all lace outfit”. Some all over lace designs give off a "too youthful" appearance. Suits tend to be figure flattering for those who have trouble spots they don't want to emphasize. Jackets and tops have hiding power. If you are thick through the middle or your trouble spot tends to be your hips and thighs, then finding a suit with a jacket that covers those areas is the key. Two piece dresses are a favorite for an informal wedding dress. The type of dress I am talking about is one that is used for special occasions or a mother of the bride or groom gowns. The two piece wedding outfit consists of a dress with a jacket. Another variation would be a 2 piece dress consisting of a matching top and a matching skirt. The dress or skirt can be floor length, tea length or street length.The fabrics can be anywhere from a soft light weight fabric to a crisp medium weight fabric. Some lace fabrics work very well especially if they are soft and drape well. Lace works well when used to make accent pieces such as a jacket or even as embellishment or trim on the dress. Your Wedding Outfit Must Be "Wrinkle Resistant"
If you are ready to purchase a wedding suit... where can you buy these wedding outfits? Click this link. Comfort is of the utmost importance! You want a wedding suit or dress that is “fuss free.” This means the style... the fit... and the fabric... must look good on you standing and sitting. After sitting you must be “wrinkle free” as much as possible. Wrinkles in your outfit will show up in your wedding pictures also. Try on a dress or wedding suit and sit down in it. Then take a look in the mirror and see if it holds wrinkles. The fabric should have minimal wrinkling or after some time start to release them. "I remember a bride who was “very upset” to see how much the wrinkles in her wedding gown showed up in her wedding pictures. The worse part was SHE and her BRIDESMAIDS attire all were very wrinkled. Another bride decided to stand as much as possible during her wedding ceremony and reception because her dress wrinkled so badly." You may be interested in some of the styles on this page. I put the designer's names on the pictures so that you can search their websites to see larger pictures and other views. You can also go to this page to find out the best places to purchase bridal suits. Mature Bride Tips Follow this advice for finding appropriate wedding attire for the older bride. Mature Wedding Dresses. 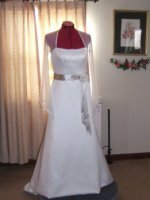 For a list of wedding dress designers who make special occasion dresses that would work for an informal wedding.